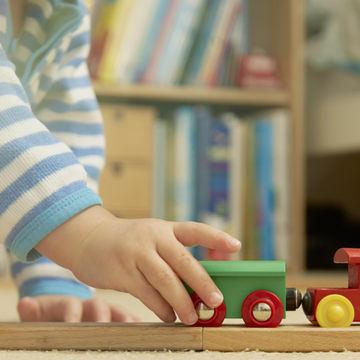 Every 3 minutes a child goes to the ER for a toy-related injury, according to a new study. Here's how to keep your baby safe. A new study warns it may not be all fun and games when it comes to the toys your child plays with. Toy-related injuries have increased by nearly 40 percent according to the findings published in the journal Clinical Pediatrics. There were over 3 million incidents reported in emergency rooms across the U.S. between 1990 and 2011—that amounts to a toy-related mishap every three minutes—with nearly 89 percent of mishaps happening at home. The spike was due in large part to kids' increased use of scooters during the study period, but for babies and toddlers, the biggest risks were choking hazards. "The most serious risk for very young children is choking on small toys or small parts of toys," said Dr. Gary Smith, senior author study and director of the Center for Injury Research and Policy at Nationwide Children's Hospital in Columbus, Ohio. "Children that age are very curious and like to put objects in their mouth as a way of exploring their environment." During that same 21-year time period studied, there were 109,000 cases of children under the age of 5 swallowing foreign objects—the equivalent of 14 cases per day. Due to that, Smith especially recommends ridding your home of the main culprits: small balls, marbles, balloons and playthings with tiny pieces. But it's important for your baby to learn through developmentally-appropriate toys. Play it safe with these tips from the American Academy of Pediatrics. Follow the directions Always read the labels and pay special attention to the manufacturer's guidelines regarding age restrictions—and take them seriously, said Dr. Laura Jana, a pediatrician in Omaha, Neb. and co-author of Heading Home with Your Newborn: From Birth to Reality. Items that pose a choking hazard will be marked with a clear warning. Be aware of toys—even the safe ones Toys for children under the age of 1 should really be soft and well constructed (no sharp edges or long strings). In addition to that, make sure that the items you let your baby play with aren't broken as it could lead to a danger that wasn't present when it was in good condition. Also, make sure pieces can't be pulled, gummed or chewed off (think: buttons on stuffed animals or dolls), Jana said. Save toys that aren't age-appropriate for later If your aunt shows up with bite-sized blocks for your baby, no need to secretly chuck them in the trash—or give in and let your baby play with them now. Simply hold on to any gifts that your baby isn't ready for until he or she reaches the age recommendation on the packaging, Jana said. For moms who also have older children at home, create a separate play area where big kids can play with toys that contain small parts away from the baby. Check for updated info If you've received toys as hand-me-downs that may not have original packaging, check recalls.gov to see if any of the items in your household have been recalled for possible safety hazards, Smith advised. In 2007, there were more than 30 million units of 104 different types of toys recalled, according to a report by The Ohio State University College of Medicine in Columbus, Ohio.